Hoping fame doesn’t go to the pup’s head. Pawtograph, anyone? Not sure if you should get a retriever? Here’s what to expect if and when you make a dog part of your hunting life. I came to waterfowling late in life, but it became an instant obsession. Thanks to magazines, online forums, and the real world teachings of veteran hunters, I learned a lot quickly. Education wasn’t the only thing that got fast-tracked; during those first years I kept the UPS guy pretty busy with deliveries from Cabela’s and Bass Pro Shops. My mentors had strong opinions on which brands and products were must-haves. I followed their advice religiously, and after awhile my garage shelves groaned with the weight of duck and goose decoys, blind-making materials, waders and clothes for early and late season hunts, hunts in ponds and hunts in fields, the works. But there was one thing I didn’t add to my arsenal: a dog. Years went by and I was still hunting over other people’s dogs. I loved watching them work, marveling at their enthusiasm for fetching downed birds and at their determination and gifted noses when tracking those that fell far off or in jungles of bulrush. And, I suffered through solo hunts without a dog, chasing after birds across ponds and through muddy hells. But I just couldn’t seem to pull the trigger on getting a dog. It was a combination of things: The thought of having an expensive and important hunting tool you couldn’t just hose off and put away after the season. The time it would take to train a dog, not to mention figuring out how to train one or what it would cost to have someone else do it. And some just plain old fear of the unknown. What if the dog were gun shy? What would I do when I traveled for business? Did I really want to take on a toddler with four legs and a ton of playful and potentially destructive energy? Heading into another waterfowl season, once more my thoughts returned to chasing ducks through the mud-cement at my local Southern California refuge. I rubbed my knees reflexively and groaned, if only I had a dog. And then I thought, why not? Kids grown and newly divorced, a dog might be just the ticket on a lot of levels. Now, some might have just gone out and got one. But my entry into the world of waterfowling had taught me that to become proficient at something quickly you have to use your resources, tap the knowledge of those with experience, and learn from others’ mistakes. It’s the difference between identifying a duck in flight and when it’s in your hand. One way ensures a good day on the marsh. The other can have consequences. So rather than go blindly into it, I soaked up dozens of DVDs, books, and articles on the subject and talked to all my hunting friends with dogs. I outlined what I required in a hunting dog, and made sure I was comfortable with the responsibilities, potential downsides, and the commitment. Only then did I feel ready. Job description – Before you “hire” a dog, define what their job will entail. Wanting a waterfowl dog usually means getting a Labrador retriever, but other breeds make good duck dogs, too. Almost any waterfowl dog can handle the occasional goose, but if you’re a full time goose hunter, you may want to go for a large male and to cross spaniels off your list. Knowing that you intend to hunt both waterfowl and upland birds with your dog, or other game such as rabbits, will also help steer you to the right breeds. The other months of the year – Getting the right dog for your type of hunting is important, but so is remembering that you’ve got a dog in the off-season as well. Consider your situation. How big are your house and yard? Are there small children or other pets in the home? Will the dog be kept indoors or out? I chose a female Lab from parents that were on the small side, because I figured she’d be easy to have around the house and in the car. It’s no scientific study, but compared to the larger male Labs I’ve encountered, she is easy on both house and car. Paying the bills – A Lab puppy can cost anywhere from a few hundred up to several thousand dollars. Sometimes it’s a case of you get what you pay for, but it can also depend on whether you’re buying from a hobby breeder with a passion for hunting dogs or a professional profit-making enterprise. What’s shocking to many is that the purchase price is just a small part of the cost of owning a dog. There’s also dog chow, vet bills, equipment, and training ­– maybe even extra fees if you rent a house or apartment. Know before you go – Once you’ve decided on a breed, do everything you can to ensure you get one of that breed’s best. Basically, there are two sides to your prospective puppy: hunting and health. A dog that’s not eager to retrieve won’t be much of a hunting partner. And no one wants to lose a beloved pet prematurely or watch it suffer through congenital ailments. There’s no guarantee you won’t be disappointed, but you can put the odds in your favor. For example, DO NOT just hop in the truck one day and go pick out a puppy. DO check out breeders, find out about up-coming litters that meet your requirements, meet the pup’s parents, and examine the health certificates and hunting qualifications for as many generations as possible. There should be clearances for hip, elbow, and eye health, and many dogs in the line should have passed hunt or field trials and have titles such as junior hunter, master hunter, working certificate, field champion, etc. A hunting lineage goes a long way, but you should also determine that the puppy you’ve picked is set to carry on the tradition. Ask to see their interest in retrieving or “taking to the wing” demonstrated. And make sure they’ve had all scheduled shots and been checked and/or treated for worms. 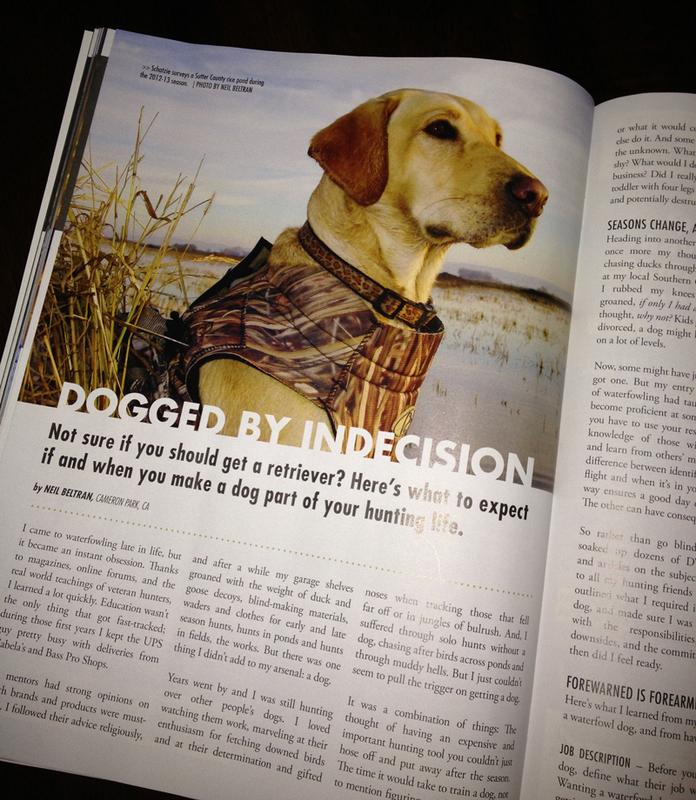 Nature vs. nurture – It’s in the DNA of most retrievers to go after downed birds and bring them back. Good breeding is a big part of their innate abilities, but to do a masterful job, your dog will require training. Depending on what you expect from your canine hunting partner, you can train a little or a lot, stopping at basic obedience skills or going all the way to hand directions and the ability to negotiate multiple, complex retrieves. Avoiding gun shyness is important, too. Starting with bumpers then moving to live or frozen birds and a gun shot – at a distance from the dog at first – is usually all it takes for them to associate that bang with a falling bird. Of course, all puppies need to be crate trained and house broken. But be advised, the unpredictability of puppy digestive systems will occasionally take you both by surprise. I always admired the bond between hunters and their dogs, but didn’t realize how deeply it went until “Schatzie” (little sweetheart, in German), a Labrador retriever, entered my world. They do a lot more than retrieve our birds; they provide companionship and comfort, make us smile at their antics, teach us patience when we see them take on difficult tasks without getting frustrated, and remind us that hunting is about having fun. Schatzie has lived up to her name in every way. At 2-1/2 years old she’s still learning her job, but I know she’ll get there, mostly because I did my homework before I got her. Doing that, plus a little luck, will help you get the right hunting dog, too. Neil Beltran is a graphic designer and hunter who has written for Muscle & Fitness magazine and California Game & Fish. ~ by zenhunter on May 29, 2013. Hello Jeri. “CWA hunting dogs” is not a pedigree element as far as I know, certainly not in the same way that having a parent that qualified for a hunt certificate is, so I’m assuming it’s just that others in your dog’s lineage have been auctioned off at a CWA event, or perhaps employed during CWA sponsored hunts. However, usually these breeders are known to CWA, so If you can provide the name of the person or breeder who sold you the dog, I might be able to find something out from one of my contacts there. It would be only general information about the breeder however, not anything specific to that dog. Did you ask for papers for your dog, then or since?